"Eat right to work and win." This 1942 comic book, available through the University of Nebraska libraries, featured prominent cartoonists telling the American public how they should eat to foster the war effort. Chic Young's Dagwood partakes of one of his famous sandwiches, Alex Raymond 's Flash Gordon "eats plenty of meat," and Lee Falk and Ray Moore's The Phantom advises us that we should have a good breakfast. (Note that Alex Raymond was the cartoonist on Secret Agent X-9, teamed up with Dashiell Hammett). Some Faber podcasts of interest. Aristocratic man-about-town Richard Rollison, aka the Toff—just one detective of the staggeringly prolific John Creasey (1908–73)—appears in "The Toff and the Runaway Bride" (1959) this week on BBC Radio 7. For the schedule or to listen online, go here. On Yale University Press's blog Michael Slater, author of Charles Dickens, discusses how Dickens's writing retreat in Kent (where he wrote part of The Mystery of Edwin Drood) has fallen into disrepair and the massive effort that will be required to save it. 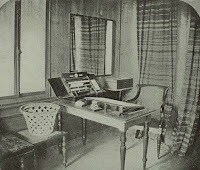 About the image: Dickens's writing room, NYPL. Sad news to hear that Robert Culp has died at age 79, after giving us his sardonic best (in PT 109, when he [as Ensign Barney Ross] and Cliff Robertson [as JFK] confront gun-wielding natives: "Speak to them in Latin, Jack."). 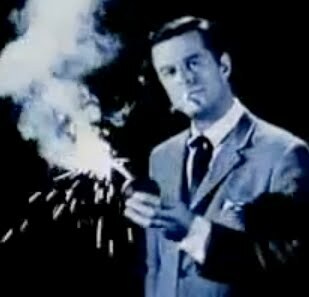 Go here to listen to the I Spy theme by Earle Hagen; go here to see Culp as FBI agent Bill Maxwell in The Greatest American Hero; go here to see a 2007 interview with Culp. About the image: Robert Culp as Kelly Robinson in the opening to I Spy. Happy to see that Stark House Press has reissued E. Phillips Oppenheim's hard-to-find novel The Amazing Judgment (1897) and Mr. Laxworthy's Adventures (1913); according to this review in the August 9, 1913, issue of New Zealand's Evening Post, the latter "holds the anxious and unwavering attention of the reader throughout." 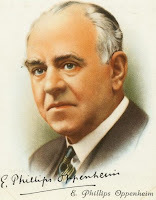 Oppenheim (1866–1946) was a favorite author of President Woodrow Wilson and Supreme Court Justice Oliver Wendell Holmes Jr., as well as an inspiration for the thrillers of John Buchan. The March/April 2010 issue of the Yale Alumni Magazine has a piece on the "psychology of the bookplate" by Alex Beam. Accompanying it are two neat slideshows of bookplates in Yale's collection. They've Shot the President's Daughter (1973). The Neglected Books blog looks at Edward Stewart's thriller They've Shot the President's Daughter! (1973), criticizing such passages as "...they snapped together like two ropes yanked into a knot." Stewart published a dozen books and died in 1996. But what about bolo ties? The Chronicle of Higher Education offers a short quiz on college presidents who wear bow ties. About the image: The late senator and university professor Paul Simon (D–IL), known for his natty bow ties. Anthony Berkeley Cox's Jugged Journalism (1925). 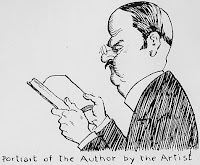 "The popular idea of an editor is a sort of literary ogre, gnashing with his fangs the manuscripts of hapless tyros and taking a fiendish delight in trampling upon the efforts of all those whose names are not sufficiently known to the public at large to restrain his savage instincts" (p. 25). • "Your detective is nearly always an amateur and he invariably has two surnames in place of the usual one and a Christian" (p. 36). "What, ho, Watson, old fruit," he said at last, tossing the letter over to me. "What does that mass of alluvial deposit you call a brain make of this, what, what?" (p. 258). Sadly, this spritely book is out of print. Please, someone republish it. Orwell on Hornung and Chase. This C-Span podcast on the George Orwell essay collection All Art Is Propaganda (featuring George Packer and Christopher Hitchens) has a small section on "Raffles and Miss Blandish," Orwell's 1944 piece comparing E. W. Hornung's Raffles works to James Hadley Chase's No Orchids for Miss Blandish (1939). Says Orwell, "[Raffles and Bunny] think of themselves not as sinners but as renegades, or simply outcasts." You can read further here. Erin go braugh: St. Patrick's Day mysteries. Women and Social Movements database available this month. To celebrate Women's History Month, the database Women and Social Movements in the United States is available online free of charge until the end of March. This resource has some 3600 documents. Miklos Rozsa on The Killers. Syracuse's online exhibition "Lights, Camera, Music" features film composers Franz Waxman and Miklos Rozsa, including discussion of Rozsa's score for The Killers—namely, Rozsa's ultimately successful claim that the theme for Dragnet was lifted from The Killers. The Guardian talks to Sara Paretsky. The Guardian's Claire Armistead talks to Sara Paretsky about V. I. Warshawski's latest appearance here. But what will Snoopy do? Online audio, 2009 RBMS conference. Among the 2009 conference sessions of the Rare Books and Manuscripts Section, Association of College and Research Libraries available online in audio are "Collecting, Auctions, and the Book Trade" and "Publishing and the Popular Consumption of Print Materials." Dartmouth professor Hany Farid explores the history of retouching photographs, even providing some 19th-century examples. 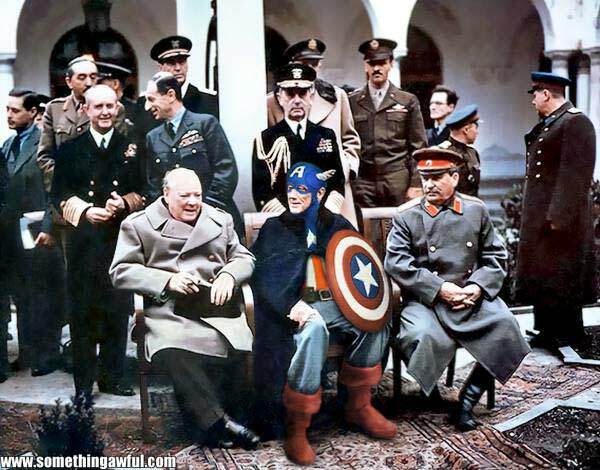 (This one, not part of Farid's discussion, features a unique visitor to the Yalta Conference of 1945). About the photo: General Francis P. Blair, who shows up in a Matthew Brady photograph for which he actually was not present. 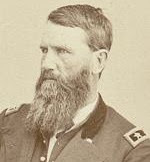 Library of Congress, Prints and Photographs Division. What they (supposedly) wanted us to read in 1895. • Mary Elizabeth Braddon, Aurora Floyd, Eleanor's Victory, Lady Audley's Secret. "The worst that may be said of her books is that the impression of life conveyed by them is generally false." • Arthur Conan Doyle, Micah Clarke, Adventures of Sherlock Holmes, Memoirs of Sherlock Holmes. "His best books are narratives of military adventure, though perhaps the most popular describe the commission and detection of crime." • Marie Corelli, Vendetta, The Soul of Lilith. "She enjoys great popularity." • Anna Katharine Green, The Leavenworth Case, The Mill Mystery, A Matter of Millions, A Strange Disappearance. 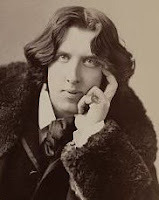 "She scorns probability both in plot and character, and, to persons of reason, her books are tiresome and nonsensical. From her popularity it would appear that reason is scarce..."
• H. Rider Haggard, King Solomon's Mines, She, Heart of the World. "He is ingenious." • Anthony Hope, The Prisoner of Zenda. "...The impossibility of all is a cold afterthought." • Edgar Allan Poe, Tales. "Morbidly imaginative." • E.D.E.N. Southworth, A Leap in the Dark, The Lost Heiress. "Her distortion of truth and fact is wonderful, and her sentimentality appalling." • Lew Wallace, Ben Hur, The Fair God, The Prince of India. "His books are extremely long, the construction is intricate, and the grammar imperfect." • Ellen Wood, East Lynne, Danesbury House. "The work is much better than much of its class." Through March 21st, the Washington Stage Guild is performing in Oscar Wilde's Lord Arthur Savile's Crime, in which his lordship, receiving the news that he is destined to commit a murder, decides to get it out of the way immediately. Go here for the Washington Post review; here to read W. B. Yeats's review of Lord Arthur Savile's Crime and Other Stories (1891). This week BBC Radio 7 is featuring the Edgar-nominated Seance on a Wet Afternoon by Australian Mark McShane, aka Marc Lovell, in which a purported clairvoyant and her husband are involved in a kidnapping. It was filmed in 1964 by Bryan Forbes and starred Richard Attenborough and Kim Stanley. Go here for the BBC Radio 7 schedule. 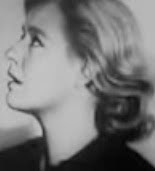 About the image: Kim Stanley in Seance on a Wet Afternoon. The Boston Massacre: Was it murder? Richard Archer, professor of history emeritus at Whittier College, discusses on the Oxford University Press blog why he thinks the Boston Massacre on March 5, 1770, was murder. About the image: A rendering of Boston Massacre victim Crispus Attucks, ca. 1897. Library of Congress, Prints and Photographs Division. Opening today at the Museum of the City of New York is the exhibition "Charles Addams's New York," which features city images by the late New Yorker cartoonist known for his skewed view of the world (especially the creation of the Addams Family). Go here to see a timeline of his career. More than a century before Schoolhouse Rock was an attempt to teach geography by setting rhymes to music, according to this post on Yale's Room 26 Cabinet of Curiosities. It's not as catchy as "Conjunction Junction, What's Your Function? ": "Texas is low and marshy near the coast/The north and west can hills and mountains boast/Jacinto battle, eighteen thirty-six/Caught Santa Anna in a doleful fix." Museyon Guides previews New York's Museum of the American Gangster, which is scheduled to open March 7. About the image: James Cagney in The Public Enemy (1931, dir. William Wellman). John Creasey's The Toff this week on BBC Radio 7. Product of the day: Sherlock Holmes chess sets.